The red-eyed vireo is one of the first birds I learned to identify by ear. His song is good to know for two reasons. First, like a lot of small birds, the vireo is not easily seen. His trim, olive green and pale yellow body is all camouflage in the dense treetop foliage where it prefers to hide out and sing. Second, for all his stealthy behavior, the red-eyed vireo is among the most vocal songsters in the summer forest. If you’ve walked the woods in Canada or the United States, you’ve heard his song. Unlike most breeding songbirds who generally quiet down after the early morning chorus, the red-eyed vireo sings nearly non-stop, all day long: Here I am! Where are you? This level of sustained vocalization is pretty unusual among birds. I can think of no other species with such an insistent message for the world—except, perhaps, certain humans who undoubtedly talk (or Tweet) too much. The red-eyed vireo, known as REVI among serious birders, has in fact been called “the preacher” by those who have found his song interminable and monotonous. This moniker in mind, I’ve taken to calling him “the Rev.” And in fact, he has become my teacher, a kind of mindfulness coach whose example is unrelenting. My dip into the birding literature tells me that each male red-eyed vireo sings thirty or more song types per day, with some individuals exceeding one hundred different strains. 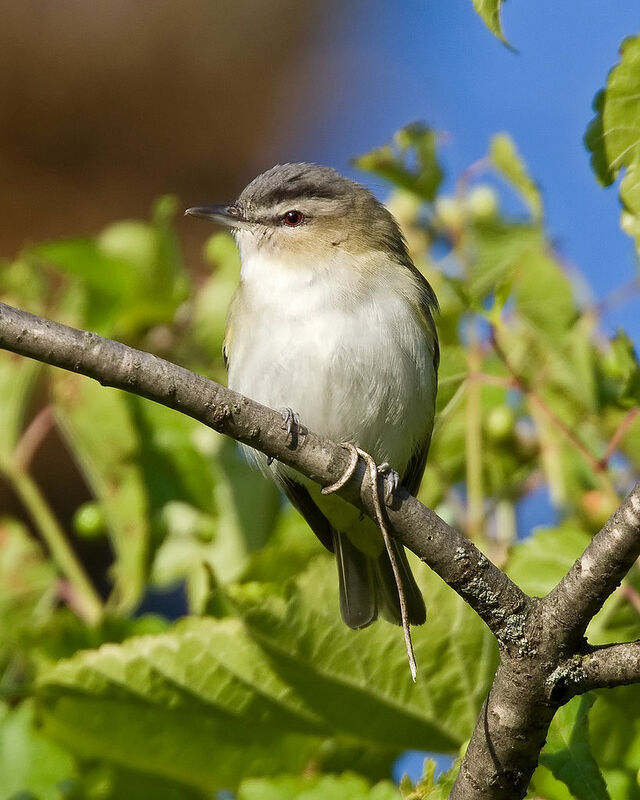 On top of that, song types of neighboring vireos differ from one another. Maybe these preachers are not so monotonous after all, but they are incredibly persistent. In 1952, a Canadian birder counted the number of songs sung by a single male north of Toronto from before dawn to evening. The total: 22,147. No one knows exactly why the red-eyed vireo sings throughout the day. My biologist friends tell me there must be an evolutionary adaptation involved—something to do with competition for habitat. One field study from the 1970s shows some evidence that the Rev may choose to avoid “acoustic interference” with other birds. This sounds sensible. If you want to be heard, you need to pay attention to timing. Regardless of the reason, on hot afternoons, the Rev is often the only bird singing in my northern summer soundscape. He wants to be noticed. Here I am! Where are you? This is the simple mnemonic device I learned to remember the vireo’s song—a short rising and falling of tones that sound to me more like chirping speech than music. He whistles compact, unhurried phrases from deep in the trees, playing casually with rhythm and interval as if he’s talking to himself rather than singing for others. Here I am! Where are you? If I approach a singing vireo in the woods, he is more apt to quiet down than sound the alarm. He resumes shortly enough, presumably as soon as he determines that I pose little risk to his livelihood, as I’m sure he observes me more closely than I do him. Even as the red-eyed vireo varies his song type constantly, I can still pick out a semblance of my mnemonic phrases from the mix.It has become how I hear the bird, if not precisely what I hear. Here I am! Where are you? With all his repetition, what is the Rev trying to tell me? Of course, ascribing English grammar to birdsong is blatant anthropomorphizing, which some biologists look upon as a scientific sin. But human beings have been anthropomorphizing—that is, attributing human traits to other species—for tens of thousands of years and probably longer. It is simply how we see and name the world: through the evolutionary lens of being human. We can’t escape from this lens, but we can learn to acknowledge it, and to use it wisely and consciously. Imagining ourselves separate from nature—whether through religious dogma or through the “objective” stance of scientific and economic rationality—has proven disastrous for other species. The “objective” worldview hasn’t been so great for humans, either. Some ecological thinkers speculate that our imagined objectivity may be the root of modern and post-modern alienation, leaving us in a sorry state of “species loneliness,” at war with ourselves and each other. Imagining correspondences between species in a shared world seems to me a necessary skill in the Anthropocene, this epoch of human-caused ecological decline. In his classic text, Nature and Madness, eco-philosopher Paul Shepard argues that proper human development depends on our learning in childhood to imagine the lifeworlds of other animals. Children raised among animals, or even animal stories, do this naturally enough. They easily learn the nuances of mimicry, hopping like a rabbit or creeping like a turtle. Shepard proposes that when modern humans stop relating to animals in this embodied way, a madness develops in which we are no longer able to empathize with others, human or other-than-human. Indigenous cultures, and other holistic and eco-centric traditions, embrace metaphors of relationship and reciprocity between people and other inhabitants of land, water, and sky. The Anishinaabe (Ojibwe) are the people indigenous to the Great Lakes region where I live. In one Anishinaabe creation story, the creator counsels Nanabozho, or Original Man, on how to survive and live responsibly on the earth by following the example of the “elder brothers and sisters”—the plants and animals that preceded human inhabitation. Heron, for example, teaches Nanabozho where to gather wild rice to eat, while the racoon teaches him to wash his food carefully. Many religions venerate particular animals for the unique characteristics, good or bad, we project onto them. Depending on one’s tradition or perspective, a snake can represent either guile or evil, transformation or renewal. Plants and animals, with their amazing adaptations and life histories, offer humans plenty of metaphors for living, and some of these are of great interest even to scientists and engineers. Biomimicry is an interdisciplinary field of environmental design that looks to nature for models to solve human problems. Japan’s bullet train, for example, was modeled after the kingfisher bird in order to reduce the large, potentially damaging shock wave known as “tunnel boom” when traveling at high speeds. Imagining animals and plants as human-like, or as teachers of humans, is part of how our species and its diverse cultures have evolved. Despite all our technical prowess—or perhaps because of its limitations—learning from the non-human world, seeing ourselves reflected in it, remains a powerful, and necessary, source of both knowledge and sensibility. Fortunately, it is one that is still available to us, at least for now. Anthropomorphizing can be problematic, however, when our projection of human traits onto non-human others substitutes for scientific knowledge about them. Snakes are neither good nor evil; they are snakes. Valuing other species based on anthropocentric criteria alone often ensures our ignorance and their extinction. In this regard, I don’t claim that the red-eyed vireo actually expresses the sentiment—Here I am! Where are you?—although, biologically speaking, these English phrases are a pretty good translation of the purpose of much avian vocalization: signalling to mates, marking territory, and responding to intruders. What I mean is that hearing and remembering the vireo this way has created an intimate relationship, one that began with remembering his name (thanks to the mnemonic), and deepened over time through the meaning I’ve made of his song. My guess is that this sense of personal intimacy with other creatures is at least as important as peer-reviewed facts about them. Some scientists and philosophers might point out that whatever meaning I ascribe to the Rev’s song distorts my ability to see and hear the bird as he actually is. This is undoubtedly true. Philosophically or scientifically, it is impossible to get inside of a bird’s umwelt, lifeworld, that wonderful term the German biologist Jakob von Uexküll coined to describe the conscious experience of other species—grasped, insofar as possible, from their point of view. In short, I’m interested in everything I can learn about the red-eyed vireo, biologically or otherwise. But what interests me most at present is his impact on me as the persistent teacher he has become. I like to think that one of these impacts is to more fully appreciate, and pay more attention to, the red-eyed vireo and all of my elder brothers and sisters. What I am proposing—what I have been practicing for several years now—is using the vireo’s song, his ubiquitous summer presence and the meaning I make of it, as a mantra for mindfulness. I consider this practice a responsive and responsible form of biomimicry, one that honors the bird and makes me more present to it, as well as to myself and others. Here I am! Where are you? Twenty thousand times a day, the Rev prods me to wake up. I welcome his reminders and confess to needing each one of them. With work, family, and everything else on the schedule, I’m often rushing through one task only so that I can move on to the next. I may be overly sensitive to cultures of speed and hyper-productivity, but if I’m not careful, life starts feeling like a pile of email I can’t keep up with. Such mindless malfunctioning keeps me from living the life I want, and even from imagining what that life might be. All this can wear me down, leaving me irritable, depressed, and distant from those I want to be closer to. I have learned this partly by growing older and confronting my own vulnerabilities, and partly by paying more careful attention—that is, by practicing mindfulness. I’ll often walk the land to reconnect and recover, and this is how I met the Rev. Here I am! His first phrase is less an invitation to be seen than it is a declaration of presence. Biologically, this declaration is part of the Rev’s survival kit in the evolutionary competition. Existentially, however—and here I acknowledge a metaphysical interpretation—the red-eyed vireo is not just telegraphing his location. He is proclaiming his existence in place and time, in the here and the now. Not all avian species do this so audibly and in such a persistent way that we humans can’t help but take notice. The grammatical emphasis—Here I am!—is on being itself, on the awareness of being alive one feels when truly awake. I admire the Rev’s bold determination to vocalize this awareness, over and over, consummating it each time with exclamation. The Rev’s second phrase—Where are you?—I hear both as reminder and reproach. If I am mainly awake and aware myself, I receive the question—Where are you?—as a welcome reminder to stay that way. Then I nod to the Rev in solidarity. I know just where I am: I am paying attention with consciousness to my experience of the present moment—what I am doing, where I am doing it, and how I am feeling. I am not lost in the looping playback of my mind’s own obsessions. In mindfulness circles, this sense of being lost in obsessive thinking is often referred to as “monkey mind,” which seems like an unfair projection of our own complexes onto a species whose mind ours may resemble, but which we can never really know. In any case, when my thinking is in a rut, and especially if I’m indulging unhelpfully in one of the mind’s many stories (an all-too-frequent reality), the Rev’s question comes at me like a challenge from God. Where am I then? Too often, I’m somewhere in my head I’ve been many times before, somewhere I don’t particularly want to stay. Here I am! Where are you? Whether I hear his song in the woods or summon it into awareness myself, the red-eyed vireo has become my messenger bird. He is just the cue I need to reset my attention and to reclaim the feeling of aliveness that I can too easily lose. Literature records many examples of birds that serve as omens and guides. From my own Euro-American tradition, John Keats’s “The Ode to a Nightingale” and Edgar Allan Poe’s “The Raven” are probably the most famous. The Rev reminds me of these other birds, and reading the poems again shows me how birds conjure human states of mind. Ultimately, the nightingale and the raven each signal the nearness of death, and the vulnerability and preciousness of life in the present moment. Keats begins his poem with the simple and forthright confession, “My heart aches.” Following his opening phrase—“Once upon a midnight dreary”—Poe likewise reveals his “weak and weary” self. Similar to the Rev, the nightingale and the raven appear as auguries of awakening to the possibilities for life, before it is too late. Poe resists the raven and his message, and thus his confrontation with death leaves him more miserable than before. Everything about the poem is dark as Night’s Plutonian shore. “Nevermore!” becomes a negative mantra, a negation of everything that Poe, or at least his narrator, can’t accept. “The Raven” is often parodied for its predictable meter and rhyme scheme, and for its portrayal of madness. But there is a realism here that I have to admire. Like a lot of people who lived before modern medicine, Poe saw a lot of death, and early death ravaged nearly everyone close to him before he died at age 40. Death wasn’t an “idea” looming somewhere far off in the future, the way most of us moderns learn to hold the “concept” of it. Death was ever-present for Poe, always tapping on his chamber door. Whether we acknowledge it or not (we usually don’t), this is just as true for each one of us. Like the tolling of a church bell at a burial, “The Raven” remains a relevant wake-up call to discover what death might teach us about living. Like Poe, Keats knew death close up. His life was surrounded by it, and many of his poems were written with the knowledge of his own imminent death from tuberculosis. (He died at the ripe age of twenty-five.) But unlike the raven’s embodiment of nothingness, Keats’ nightingale becomes the counterpoint to the poet’s suffering. At first, Keats hears in the nightingale’s “full-throated ease” undertones of the “embalmed darkness” surrounding human life. But the bird soon becomes a vehicle for escape into the imagination, a reminder of a place elsewhere. She is hailed as “immortal,” and her ecstatic song, though it too fades, ultimately emboldens and enlivens the poet. As a symbol of the poetic imagination, of Romanticism itself, Keats’s nightingale can be read as less real that Poe’s raven. The bird is otherworldly, a porthole to a better place where Keats might “leave the world unseen,/And with thee fade away into the forest dim.” It is tempting to read the poem as an escape from reality, but for Keats and for many poets, the imagination, the quality of mind represented by the nightingale, is reality. The nightingale is the embodied reminder of another mindful way of being in this world, another way of experiencing and expressing life and of coming to terms with death. Finding a language to keep ourselves awake takes an effort of imagination, as well as practice. This is all the more challenging to pull off because in the end, the odds are against us. For as Keats knew better than most, the low tones of “Nevermore!” lurk beneath every earthly utterance. Birds—ravens, nightingales, red-eyed vireos—may be no more immortal than people. But they have been here, on earth and above it, longer than we have. Somehow—it may have to do with their wings—they remind us: carpe diem, get on with it now. So it is with me and the Rev. There’s nothing mournful, foreboding, or forlorn about it. He’s just letting me know he’s here. He just keeps asking, who else is awake? Of course it is of no use to direct our steps to the woods, if they do not carry us thither. I am alarmed when it happens that I have walked a mile into the woods bodily, without getting there in spirit. In my afternoon walk I would fain forget all my morning occupations and my obligations to society. But it sometimes happens that I cannot easily shake off the village. The thought of some work will run in my head and I am not where my body is,—I am out of my senses. In my walks I would fain return to my senses. What business have I in the woods, if I am thinking of something out of the woods? I suspect myself, and cannot help a shudder, when I find myself so implicated even in what are called good works,—for this may sometimes happen. I’ve read this passage many times and often remember it on my own walks when I find myself distracted or self-absorbed. Like the vireo, Thoreau is a salutary companion. Reading the passage again, I am struck by the repetition of the archaic word, “fain”: “I would fain forget all my morning occupations and my obligations to society…. In my walks I would fain return to my senses.” The Oxford English Dictionary defines “fain” as “pleased or willing under the circumstances.” Though he implies that he does, Thoreau does not say how, or even whether, he successfully shakes off the village and returns to his senses; he only says that he would be pleased and willing to do so. How is this actually accomplished? External circumstances and events of many kinds can shift one’s mindset. If a tornado suddenly blew into the neighborhood, most of us would wake up fast, our senses on high alert to the novelty of extreme experience. But how can we shift our state of mind internally when it gets stuck in what neuroscientists call its “default mode network”? The default mode network is the neurological network our minds habitually travel based on our past conditioning. Observable on brain-scan imagery, these networks seriously limit our experience to the rutted grooves of our mind’s most popular, and often least helpful, stories. What we are not very good at doing when caught up in these networks is directly experiencing the present moment. Mindfulness is the modern practice of paying attention, intentionally and without judgement, to the present moment. It has been shown to interrupt default mode thinking and even to help create new neuropathways, new ways of experiencing and responding to the world. Its transformative or remedial power is the reason so many modern people seek it. But the default mode network is a powerfully predictive force, both conditioning our behavior and limiting our awareness of it. For many of us, without mindfulness or other contemplative practices, it can easily dominate the mind, even Thoreau’s. Experienced meditators report that having a teacher to support their mindfulness practice can be extremely helpful. I think I’ve finally found mine. Here I am! Where are you? The red-eyed vireo is a persistent reminder from the external environment to reclaim presence internally. Monks and meditators are taught to listen for the ringing of a bell, or the deep tones of the gong, to awaken their attention. With practice, responding to this summons is to be re-minded, even at the neurological level. The process involves paying attention, over and over, to thoughts, feelings, and sensation, in order to notice how the mind’s defaults operate and how to reclaim one’s desired focus. Waking up is not as easy as it sounds, but the preacher bird, the Rev, is generous with encouragement. Twenty thousand times a day: Here I am! Where are you? He delivers his message freely from a supple perch in the trees, swinging with leaf, shadow, and sunshine. This is the home we share. The same land makes both of us come alive. It remains for us to listen, and to respond. 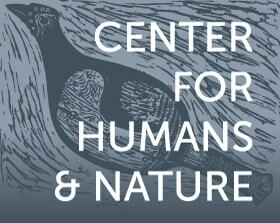 Cornell Lab of Ornithology, https://www.allaboutbirds.org/guide/Red-eyed_Vireo/overview, . accessed September 7, 2018. R. Godard, “Red-Eyed Vireos Have Difficulty Recognizing Individual Neighbors' Songs,” The Auk (1993): 857862. P. Shepard, Nature and Madness (Athens: University of Georgia Press, 2011). I respectfully borrow this wisdom from the following source: R. Wall Kimmerer, Braiding Sweetgrass: Indigenous Wisdom, Scientific Knowledge and the Teachings of Plants (Minneapolis, MN: Milkweed Editions, 2013). J. von Uexküll, M. von Uexküll, and J.D. O’Neil, A Foray into the Worlds of Animals and Humans: With a Theory of Meaning (Minneapolis: University of Minnesota Press, 2010). E.A. Poe, “The Raven,” https://www.poetryfoundation.org/poems/48860/the-raven, accessed September 7, 2018. J. Keats, “Ode to a Nightingale,” https://www.poetryfoundation.org/poems/44479/ode-to-a-nightingale, accessed September 7, 2018. H.D. Thoreau, “Walking,” Natural History Essays (Layton, UT: Gibbs Smith, 2011), 98-99. For an accessible example of how mindfulness impacts default mode networks, see, for example, R. Wright, Why Buddhism Is True: The Science and Philosophy of Meditation and Enlightenment (New York: Simon and Schuster, 2017). David A. Greenwood, PhD, is Professor and Canada Research Chair of Environmental Education at Lakehead University in Thunder Bay, Ontario, Canada. His scholarship, teaching, and activism revolve around place-based, environmental, sustainability, and holistic education. Widely published in these areas, he is also co-editor of several books and journals, including Place-Based Education in the Global Age: Local Diversity.